First night on the Trail - Musketeers Too! 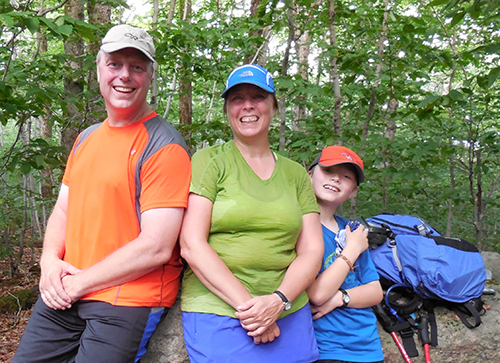 The Musketeers, Too happily start their hike north to Canada. With our truck loaded with three full packs Carl, Jonathan and I left Huntington at 8:30 am Sunday, July 14 to drive to the southern start of the Long Trail. Today we planned to hike around 6.6 mile. I consider this a half day hike and wasn’t in any rush to make it to the trail before 1 pm. Todays hiking goal was to start hiking at 1 pm. My previous 1997 LT hike I accessed the LT via the Pine Cobble Trail. This time I had a different plan. A good family friend who has section hiked the LT many times over recommended driving in and parking on County Road. This put us .5 miles from Seth Warner shelter and we could hike to the Vermont/Massachusetts border (the start of the LT) and back by dinner. From Seth Warner to the Southern start of the LT is 2.6 miles (5.5 round trip). We parked our truck by 1 pm in the parking area on County Road. As we were double checking gear and putting our packs on, a Northbound AT hiker by the name of Eleven popped onto the Road. She was excited to share her AT experiences with us. Today she was having a late start from a night in North Adams where a restaurant provides a free meal to thru hikers. She was now heading to Congdon for the night and had 7 miles to go. While chatting with Eleven, Dunco, a Southbound AT hike stopped to chat. He was young, thin and carrying a very light pack. He explained that he was very low on food and was looking forward to spending a night in North Adams to replenish his food supply. Eleven brightened his eyes when she told him about the restaurant offering free meals to hikers. His mom was his resupply angel, who as he put it,”likes to send too much wealth”. When he receives her packages he usually has plenty to add to local hiker boxes. These are boxes located at mail drop locations where hikers can leave unwanted items for other hikers to have. His hiker box donations sometimes included an extra pair of hiking shoes. He laughed and said “my mom thinks I need frequent resupplies of new shoes — but I don’t”. These two AT’ers happily headed off to their evening destinations. This was beginning to become an AT highway as a third Northbound AT’er burst out of the woods. This was Spoon. He got his name because he is often found lying on the side of the trail asleep, with his arms above his head in the shape of a spoon. He was a tall lean man to be in his 60’s. He has been out enjoying and learning the trail life since March. 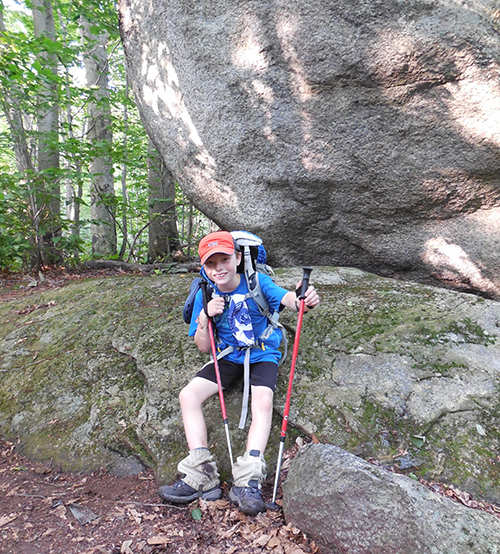 He was excited to hear we were just starting the Long Trail and asked if we had an extra fuel canister. He had run out of fuel days ago and was not able to find fuel in North Adams. He had stocked up on Instant Breakfast and was learning to hydrate couscous with cold water. Without fuel he couldn’t cook. I just happen to have my next food drop box in the truck and happily gave him a new fuel canister. He insisted on paying me $5 for it. I really didn’t want to charge him, but accepted the money and gave him a cold ripe peach. As he scramble up the trail he said “This is the best $5 peach I’ve ever purchased…thank, thank you…”. We had performed our first trail magic! Carl was very fascinated knowing that these hikers have been on the trail for at least four months! He found their stories and survival skills acutely interesting. After a cheerful social time, we headed on our way to Seth Warner shelter. It was a buggy 20 minute walk. A single AT hiker was already at the shelter for the night. His name was Torch — a north bounder who has been back on the trail for less than a week after spending time with family in Rhode Island. He said it was very odd to rejoin society after four months of trail life! He informed us that the water source at the shelter was very good and to beware, the bugs heading south were bad. He carried a full Mosquito Box Net to sleep in. We told him we had our 3-man tent and said we were wise. There was plenty of tenting space behind the shelter and we had first dibs to choose the most level spot for our tent. This way when we returned, we could just cook dinner and go to bed. It was hot and a bit muggy, so we left the fly off. We told Torch we’d see him later and headed south to find the start of the Long Trail. This 2.6 miles has much less elevation change than if we had hiked up Pine Cobble Trail. Wee moved steadily as we hopped stones over mud bogs, bounced over a few small streams and passed four other Northbound AT hikers. Then the mosquito’s and dear flies found us. It was hot and muggy. The Deet just melted off us and became more of an attractant for the bugs. We took few breaks to keep ahead of the bugs. 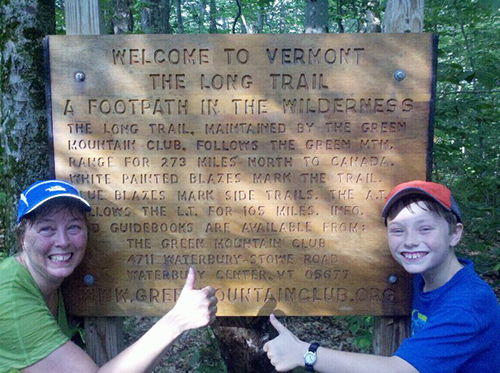 After about 2 hours we made it to the Southern start of the Long Trail. Carl ran very excitedly as if to hug the Long Trail welcome sign. “We made it!” he shouts. Our journey through the wilderness of Vermont has begun. We snacked and took documentary photos and headed hiked back to the shelter for dinner and a good nights sleep. Our journey through the wilderness of Vermont has begins. We were back by 7 pm and found five AT hikers at the shelter for the night. Sadly, one AT hiker had a dog. Carl is allergic. This is why I carry a tent — just incase we run into overnight situations where other hikers have dogs. This way I can guarantee that Carl can sleep in a pet free environment. The shelter’s water source was wonderful. I sent both Jon and Carl down stream to freshen up and get in to camp clothes while I filtered our water. I purchased a new Sawyer Squeeze filter that only weights 5 oz. It’s very easy to use and found it to be a cool new valuable way to filter water ($36 from Amazon). Carl takes a break by a big boulder on our hike back to the Seth Warner shelter. ate Salami, cheese, crackers, bagles and carrots for dinner. Carl was a bit upset — he was looking forward to a nice cooked hikers dinner. I said we will the next night. I explained that sometimes we need to keep it simple. In the dark, Jon and I found a good limb to hang our food bag, we all brushed our teeth and called it a night.